When I first saw Ed Stetzer’s original article titled, MissionTrends: 4 Trends for Churches to Consider, I had some points of difference but wasn’t sufficiently motivated to write about them because, overall, I think we should all think more about the future. But the article crossed my sights again in “Charisma News” titled, 4 Trends in Christianity That Could Scare You, According to Ed Stetzer. I don’t why this was in my feed, but there it was. So, I decided to look at the article again. I think what tipped me over was that Charisma News added “That Could Scare You” in the title. 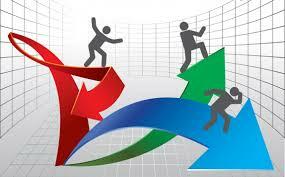 So here are some are some “off of the top of my head” thoughts about Stetzer’s “4 Trends”. There are few books that I’ve returned to over and over again to help interpret life more than Dietrich Bonhoeffer’s “Life Together.” Bonhoeffer the man was fascinating enough even without his profound insights into the Christian life: a resistant German theologian and pastor during the time of the Nazis, a spy, and a participator in a plot to assassinate Hitler are just a few interesting aspects of his resumé. But layer on top of that the eloquence and depth of his writings, and you have a man I would really love to spend many hours with over beer. News broke recently of two beautiful teenage girls from Austria, aged 15 and 16, who became burka-wearing recruiters for the terror group known as ISIS, or the Islamic State. And their journey to radicalism is not an isolated case. In my own state of Colorado, a 19-year-old female just pled guilty to trying to join ISIS, too. And then there are the two young American men who died in Syria fighting for ISIS. Why are young 21st-century Westerners converting to a brutal form of Islam? Why would young people, with seemingly so much to live for, leave the West for terrorism? This question came up last month in a panel discussion with radio hosts Hugh Hewitt and Dennis Prager, as well as Stephen Meyer of the Discovery Institute and myself. We all agreed that the answer was not the radicalism of Islam, but the current emptiness of Western materialism. The idea that matter is all that matters pervades everything young people see and hear these days. They hear it in science class, from the new Cosmos television series, and even, and as I added especially, in advertising and other media messages. Nearly every commercial message tells us that we’re born to be consumers, that stuff will make us happy and save us from our misery, and that there’s nothing beyond the immediate gratification of this world to live for. As Dennis Prager said that night, “Secular society produces a lot of bored people . . . Secular society is a curse because ultimately life is meaningless if there’s no God.” The materialistic salvation sold to us promises to fill what Pascal called the God-shaped hole in our hearts … with stuff. But many see the meaningless of secular salvation, and they become bored; others become angry, even murderous. This sort of empty pop-nihilism, to borrow a term from Baylor’s Thomas Hibbs, makes even the evil radicalism of extremist Islam look attractive to some. And parasitic ideologies like these find folks in despair easy prey. Might it be that ISIS finds this shallow ground as fertile soil from which to harvest young souls for its deadly agenda? Decades ago, even before the Internet and social media took over so much of our lives, Aldous Huxley warned of the capacity of the media to exploit “man’s almost infinite appetite for distraction.” Could it be that even ISIS looks attractive to those who, after having their fill, still feel empty inside? 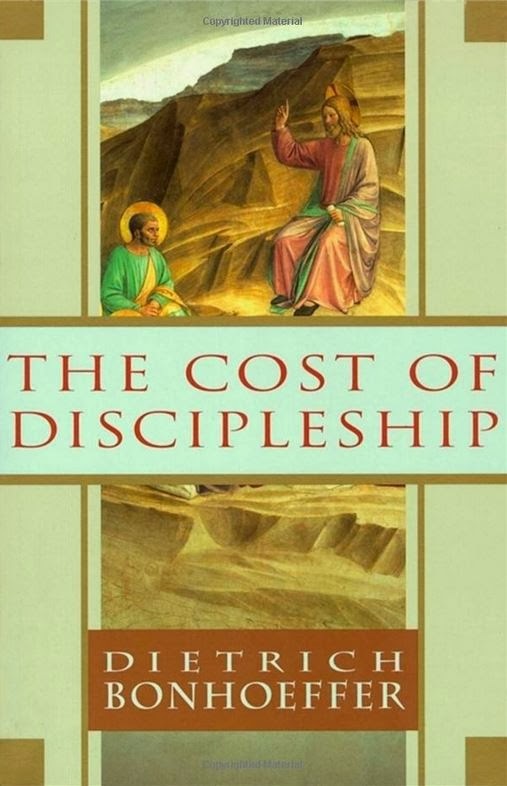 Bonhoeffer’s work at Finkenwalde bore fruit in two books: The Cost of Discipleship and Life Together. From the day of their publication in 1937 and 1939 respectively they were read eagerly by the laity for the vital exposition they gave what grace really is and is not. Some chapters are still felt to be vital and effective today all over the world. ~ Eberhard Bethge, Costly Grace, 89. 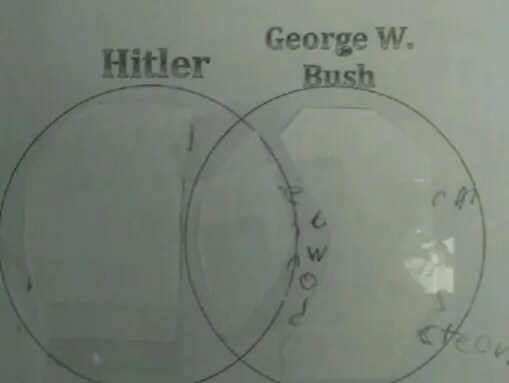 A sixth-grade teacher at a Washington, D.C., middle school is in deep water after assigning students to make comparisons between former president George W. Bush and Adolf Hitler in a class project. The assignment prompted complaints from at least one parent, who said that it showed disrespect for the office of the president, according to WRC-TV. 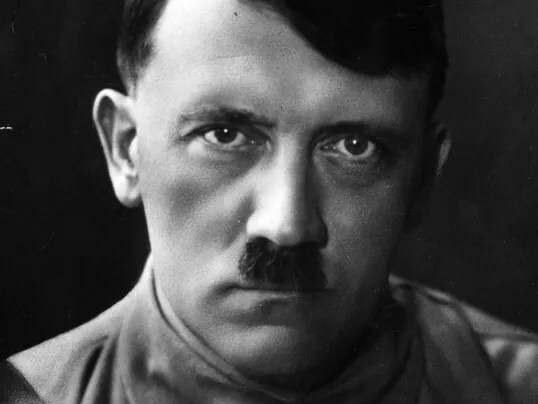 A copy of the assignment, made by the parent and posted on social media, instructs students to draw examples from two texts they were assigned and to fill in a Venn diagram with similarities and differences between the two men. According to the Washington Times, the parent, who asked the paper not to be named, said he called the school office to complain and was told that the assignment was part of a curriculum unit approved by the school system. 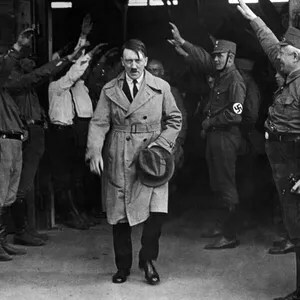 He said his sixth-grader’s class had been studying both the Holocaust and the Iraq War. A spokeswoman for D.C. Public Schools told the Washington Times that the two readings had been approved but that the texts were not meant to be compared as assigned by the teacher. “The teacher deeply regrets this mistake, and any suggestion to malign the presidency or make any comparison in this egregious way,” school system spokeswoman Melissa Salmanowitz said. You don’t have to reference Greek or Hebrew to study the Bible. You can observe, interpret, and apply using a decent English translation (such as the ESV or NET). In fact, knowing a bit of Greek can actually distract you from careful study of a passage. In John 21:15-19, Jesus and Simon Peter eat breakfast and chat about love and lambs. Three times, Jesus asks Peter, “Do you love me?” Three times, Peter affirms his love, and Jesus calls him to be a godly shepherd. Those who dig into the Greek text of John 21 quickly discover that John uses two different words for “love.” Jesus’ first two questions use the word agape. Jesus’ third question and all three of Peter’s responses use the word philia. The question arises: What is the difference between agape and philia? What’s really going on in the conversation that doesn’t come across in English? So the student reads commentaries and consults lexicons. Many blogs address this particular question (just Google “agape philia john 21,” and you’ll have no shortage of reading material). Some say that agape love is the higher form of love, and Jesus comes down to Peter’s level the third time. Others reverse it, saying that by the end Peter convinces Jesus that he has the right kind of love. The problem with this approach is that it assumes that each Greek word has a focused, specialized meaning. It approaches lexicons as technical manuals, almost as if there’s a code to be broken, and the right tools offer the key. But no language works that way. Not English or German, Greek or Hebrew. Words certainly have histories. They have ranges of meaning. Lexicons help us to understand their range of usage. But literature is as much an art as it is a science. Writers advance their agendas by making them beautiful. So they use synonyms, turns of phrase, metaphors, and other such devices.